Commercial mobility is yet to hit its full disruptive potential, but it will transform our whole notion of “work”. The world of work as we know it is poised to change forever. Business is about to boldly go where no company has been before. And it’ll be fuelled by the next generation of mobile technology. As consumer mobility matures, commercial mobility has yet to hit its full disruptive potential. And this isn’t about emailing at the family dinner table, or the odd day working from home. Mobility is going to pull into question our whole notion of “work”. With PwC predicting that the global gig economy will be worth $63bn by just 2020, what will a “job” really mean to children born today as they leave education? A globally connected network of “guns for hire” could be selling their freelance services to the highest bidder in a highly fluid digital marketplace, whether they are a brain surgeon or a tree surgeon. All prompted by the proliferation of mobile devices and apps. And getting to work will be revolutionised. Boston Consulting Group predicts that the rise of autonomous vehicles, and associated car-sharing, will reduce the cost of car travel by 20-40 per cent, and cut average journey times by 40 per cent in 10-20 years’ time. Suddenly, the wasted hours spent crammed into metro and commuter belt rail services become unviable and unnecessary. And as the car completes its evolution into a connected computer on wheels, it becomes a productive work environment in itself – at least for those of us lucky enough not to suffer from travel sickness. Petrol or electricity may power the mechanics of our car, but mobility is powering its evolution. It’s why we’re seeing collaborations between car makers and telco equipment firms, such as the recent deal between BMW, Audi and Mercedes-Benz and Ericsson, Huawei, Intel, Nokia and Qualcomm to accelerate development of the 5G infrastructure needed for self-driving cars. This said, “work” as a single location we commute to each day may be an obsolete concept long before our cars drive themselves. We’re already moving towards the notion of a “blended life” whereby folks increasingly see work as “a thing you do” and not just a “place you go”. At the same time, co-working spaces have recently exploded in popularity in cities across the globe. These attractive, collaborative environments are hotbeds of innovation. They’re a physical embodiment of today’s dynamic employment market, and of generation Y’s desire to explore its entrepreneurial potential. But co-working isn’t just for start-ups. Corporates are also getting in on the act, with companies such as KPMG opening their own doors to create centres of collaboration. The office of the future probably won’t be an office at all. Expensive city-centre floorspace, with its doors locked to outside influence and innovation, will begin to look like a thing of the past, and “out of office” will become the norm, not the exception. But like the gig economy and self-driving cars, co-working space doesn’t function without intelligent mobile technology. As the global workforce goes increasingly mobile, people need to take their offices with them wherever they go. Employees are in search of a PC equivalent to a swiss army knife that can transform based on the task at hand. As such, we’re delivering devices that bring traditional PC-based productivity to a more mobile experience, in a way that IT can securely manage and service. For instance, we recently launched the HP Pro x2, a versatile tablet and notebook ‘detachable’ device featuring multiple modes for commercial use. We also announced a range of new accessories for the HP Elite x3, the first true 3-in-1 device for mobile workers. 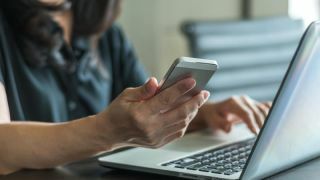 These new technologies are designed with versatility in mind, to help mobile professionals be productive and remain connected, whether they are in the office or on the go. Mobility began with consumer usage, but I believe the real application is for enterprises and organisations. Three quarters of CIOs say mobility will have a bigger impact on their business than the advent of the internet. Mobile technology is already transforming analogue workflows that haven’t changed in decades, boosting efficiency & productivity. And now it’s set to fundamentally transform what we consider as “work”. Nick Lazaridis, President, EMEA HP Inc.